Daisy, along with Blue Doily and Navajo, was the first promotional pattern to have a wicker basket. Daisy was released as a promotional pattern in 1969. Other than the wicker basket that came with the Oval Casserole, the promotional pattern is indistinguishable from its standard counterpart. “What happens when you add cheery yellow flowers to famous Pyrex Ware? Daisy happens. And Daisy just happens to be the bright, sunny new way to make mealtimes happier and cleanup times easier,” proclaimed a 1969 advertisement. Daisy was a popular standard pattern with this promotional spinoff available to the consumer market between 1969 and 1970. The promotional pattern is identical to the standard pattern, appearing on the 1 ½ quart Oval Casserole (043) and the 2 ½ quart Oval Casserole (045). 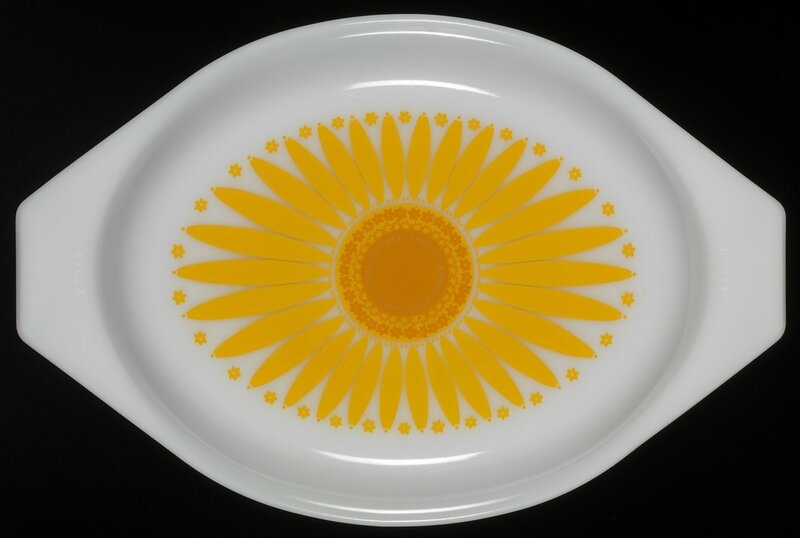 As with the standard pattern the promotional design has either an orange or yellow solid-colored dish that includes an opal ware lid with a large bright yellow daisy on top. The only distinguishable difference is that the promotional Daisy pattern came with a wicker basket. The promotional Daisy pattern retailed for $4.95 or $5.95. Daisy, along with Blue Doily and Navajo, was the first promotional pattern released with a wicker basket.